I make a point of not buying supermarket beef anymore, but when I saw packs of freshly-cut marrow bones being added to the Stop & Shop meat display, I couldn’t resist. I may be picky about the actual meat, but bones are bones, and cheap bones taste the same as expensive bones. I knew we were having soup for dinner (turkey noodle, the last of the gift that kept on giving), so I wanted to prepare a special side for She Who Must Be Obeyed and He Who Will Not Be Ignored. We’ve all eaten bone marrow before, in fact, we’ve eaten it a the place where it became famous, but I had never prepared it myself. 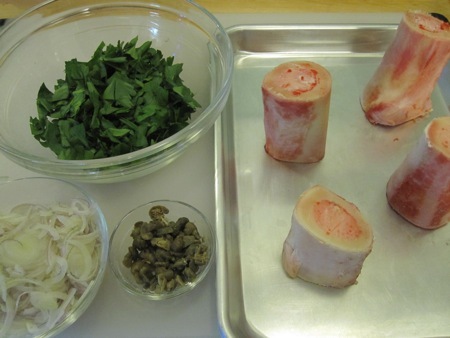 calls for three bones per person, but I settled for one pack of four, which I readied along with a “healthy bunch” of flat-leaf parsley leaves, two thinly sliced shallots, and a “modest handful” of rinsed salt-packed capers (chopped, due to their large size). 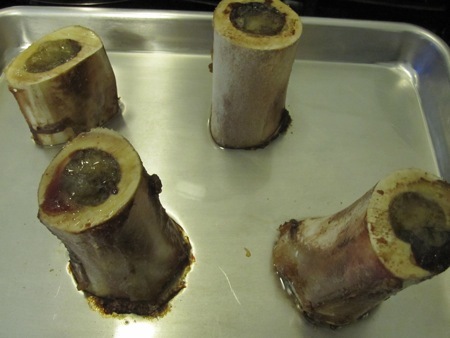 I roasted the marrow in a 450°F oven, pulling them out after fifteen minutes before the marrow completely liquefied. While the marrow roasted, I tossed the parley, shallots, and capers together and dressed them with a splash of olive oil, the juice of one lemon, and some salt and pepper. I toasted a few slices of homemade bread and served. We scooped out the marrow, spread it on the bread, sprinkled some sel gris on top, then added a pile of the parsley salad. It tasted as good as I remembered. 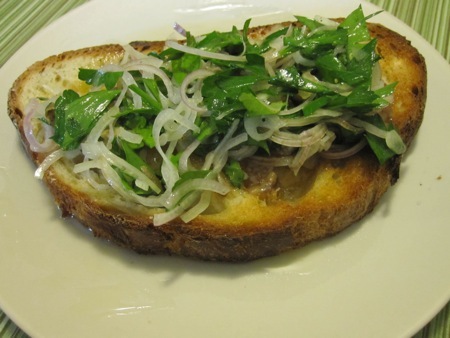 The bread soaked up the fatty marrow, and the salad provided necessary brightness and acidity. It’s still a perfect dish, topped with what Anthony Bourdain describes as “butter of the gods.” It’s also idiot simple to make, so there’s no excuse for you not to indulge yourself. Just reading the title of this post had my mouth watering. I’ve made this a few times at home, but it never quite matches the St. John version – frustrating, given how simple it all is, and odd that it’s always the parsley salad that trips me up (theirs is quite heavily dressed with oil, without being overwhelming, but when I attempt that, it ends up far too oily). My version is pretty close, but falls a bit short with the bread. The St. John bread is thick and slightly charred, a result I can’t replicate. Oh, that looks great! I really like, in general, how thoroughly and well you illustrate your process with photos. My current situation is an unfortunate combination of spartan & chaotic, but I hope things will improve soon , particularly with the addition of some great south-facing windows in a new flat which will give me better light to photograph in. As I’ve said in my guanciale post, I intend to make lots more as it’s so delicious! I’d very much like to try making it with a mangalitsa jowl. I also have a great deal of interest in David Chang’s recipes, and your posts describing Momofuko recipes (like the most recent one) are nudging my confidence upwards –thanks for that. My photography is in need of serious improvement, something I hope to work on in the coming year. Do I need to tell you how jealous I am that you have access to mangalitsa pork? You should just dive into the Momofuku recipes. They’re surprisingly simple, but occasionally require advance prep of sub-recipes.